Earn $61.37 in Rewards credit (6137 points) What's This? 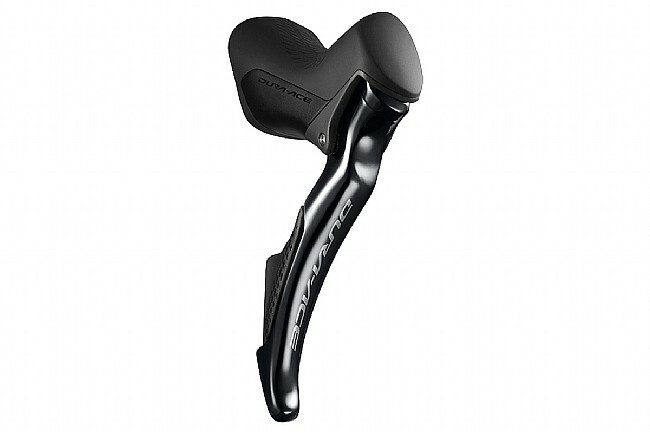 Dura Ace Di2 hydraulic levers have never felt better than with the ST-R9170 shifters. Improved tactile feedback reduces vagueness when shifting in chaotic situations or with thick winter gloves on, and the braking mechanism has been engineered to provide the perfect balance of power and manipulation when racing in the peloton. The rubber material on the hoods has been refined for more confident grip, and the profile is almost identical to that of the mechanical-brake R9150 version for racers switching between bikes for different course conditions. Hidden buttons at the tops of the hoods can be programmed to control shifting, computer display screens, or other functions. Multi-shift can be toggled on for each individual button on the lever. And compatibility with Shimano's Synchro Shift allows the front derailleur to shift automatically with the rear derailleur.